Experts say EHRs have benefits, but much of the technology's potential remains untapped. Several years removed from the technology feeding frenzy resulting from the introduction of the meaningful use program and the HITECH Act, health care organizations still are scrambling to get the most out of their EHR investments. Despite hope that the technology would create a Parthenon of both financial and care benefits, there remains user frustration. In some cases, the jury is still out about whether EHR data can be used to improve organizational administration and patient outcomes. As investments in the systems cool, hospitals continue to explore ways to get the most out of the technology. Some have succeeded while others have struggled to justify the cost, giving rise to some dissension in the ranks. Donald M. Voltz, MD, medical director of the main operating room at Aultman Hospital in northern Ohio and an assistant professor of anesthesiology at Case Western Reserve University and Northeast Ohio Medical University, says much can be done to improve EHR efficiencies from both a clinical and an administrative standpoint. He says EHRs are rudimentary, immature tools in need of further development, noting that the technology often leads to caregiver frustration and can create communication breakdowns between staff, management, and the vendor. "I still consider [EHRs] in beta and feel there's a disconnect for how to access patient information, care information, and … looking at business processes," Voltz says. "The idea of the EHR has become an afterthought—most organizations have implemented—but the maturity level is still in the early phase," says Ryan Uteg, principal at Impact Advisors, an HIT consulting firm. One common gripe with EHRs is that there's little or no consistency to how patient information is entered or accessed. "There's no understanding for how processes and care paths are being followed," Voltz says. "Interoperability is not here. We don't even have standardization, and there's no way to impose pathways for how clinical providers interact with the data." Providers often are required to work in multiple systems across various settings, including with competing organizations, Voltz says, noting that many of his colleagues at Aultman also serve other local institutions. In some cases, conflicting EHR systems are in place, a scenario that likely plays out throughout the country, he adds. However, considering that many organizations have had only five to seven years to use the technology, there's still time to optimize EHRs, Uteg says. As hospitals become more EHR proficient, opportunities such as population health management will emerge, he says, adding that an outcomes-driven approach and established workflows can help organizations obtain more value from the data captured. "There's an incredible amount of information now and organizations are trying to tap into it," Uteg says. "They've got to be able to measure that value. Organizational leaders should ask themselves: 'What additionally can I do to drive change in the organization?'" As the industry transfers from a fee-for-service to a value-based model, the urgency to optimize data will increase, he adds, noting that many organizations have not been able to realize optimization opportunities, resulting in their EHRs doing little more than automating paper processes. To gain the most value from their EHR, Uteg says organizations must make the data it generates usable. Once that's accomplished it's possible to generate quality and outcomes reports, establish a centralized data repository, define a set of workflows across the organization, and reduce the variability of care. At the very least, EHRs should be able to standardize processes and procedures across the organization, improve care, and help achieve better financial performance, he says. John Daniels, vice president of strategic relations at HIMSS, says hospitals have concerned themselves more with extracting the promised benefits of EHRs, eg, eliminating handwritten medical records, prescriptions, progress notes, and problem lists, than extracting any additional value. "A virtually paperless environment where all information about a patient is stored in the EHR is certainly the beginning," he notes. "How information is stored affects outcomes and efficiencies. Where the real magic comes in is capturing information discreetly to help drive clinical decision support." In the long term, EHRs must play a greater role in guiding physicians at the point of care. For example, during documentation, an EHR should provide physicians with treatment recommendations and recommended protocols. Clinical decision support protocols can help hospitals support patient care and standardize treatment for those with specific conditions, Daniels says. However, according to Thanh Tran, CEO of Zoeticx, most EHRs are designed as patient data recording devices incapable of providing user interfaces that easily present data to providers at the point of care. The technology is not always conducive to use in the care setting and typically is one size fits all, he adds. With few customized solutions, health systems find that their data must be presented based on user type rather than displaying every detail in a singular view. Waiting for vendors to release new products to address such issues is not a viable option, Tran says. Voltz agrees, noting that EHR companies are struggling to serve customers while operating under imposed federal mandates. To address limitations, hospital staffs have been known to create EHR workarounds to make data entry quicker at the point of care. "Doctors throw their hands up and tell nurses to make it happen," Voltz says. "Nurses are expressing the most frustration [with EHRs]. Physicians have developed very efficient ways to take care of their patients and are worried about making a mistake; they make sure everything is covered. One size EHRs fit nobody as far as physicians are concerned." Creating workarounds in which hospitals open themselves to the potential of human error is not an answer, Tran cautions. Instead of creating workarounds to handle functions not native to their out-of-the-box EHRs, he recommends adding middleware to accommodate adaptations. Integration across functionalities and departments is a significant challenge, as is seeing data when and where they're needed. Middleware software, which Tran says is going to be HIT's next big trend, allows disparate technologies to speak to each other while leaving the EHR intact. Tiffany Casper, CNM, MSN, president of EMR Consultants, cites several reasons why EHR development remains in its early stages. While the technology eliminates paper charts and allows patient records to be viewed across multiple locations, it does not make data available in real time, preventing them from having an impact at the point of care. Also, how patient information is viewed and by who needs improvement, says Casper, who believes it's inefficient to make all data available to everyone. "From the viewpoint that I would want to view a chart as a midlevel provider is totally different than if I were a cardiologist," she says. "It's nice to see the whole record, including labs, but some results I'd be interested in, others I wouldn't care much about." Data collection is stressful for the nursing staff, Casper says. To solve this problem, some hospitals are hiring scribes to enter data into the record on behalf of the provider. This nontechnical workaround has drawbacks, however. First, more people are accessing sensitive patient data than need be. Also, more staff members are managing the technology, further reducing efficiencies. "Throwing more people at a technology problem rather than making systems easy to use and improving workflow [is not a good idea]," she says. Providers are not taking full advantage of their EHR, although some are trying to innovate how they use its features, says Uteg, who mentions moving beyond patient portals to better leverage the technology's patient communication capabilities as an area for improvement. He says forward-thinking facilities also will investigate how their EHR can help generate better reports and examine workflow to determine how data are being used. Marty McKenna, vice president of population health at Allscripts, says organizations are beginning to answer the questions raised during the technology's early days. "We all knew back in 2007 that we were going to put in EHR and figure it out later," he says. "Now it's later; the goal is still the same: take data, liquefy it, drive change." Data-driven organizations that act on those assets will have an advantage over competitors, McKenna says. For example, insights derived from digging into data on the local population can help organizations better understand the reasons conditions exist within the community. "Health care is local. The population in the Bronx is different than in Pittsburgh," he says. "Some organizations are going to live and die by their data; for others, it hasn't become a priority yet," McKenna continues. "Everyone is on their own curve. My sense is that those that are in the pool will move fast and those that are putting a toe in the water will reason that even if they are a little late to the party at least they'll know where the party is." What's holding back hospitals from taking the data analytics plunge? Daniels says financial considerations may play a part or perhaps hospital leaders simply have not made it a priority, instead choosing to divide investments around the organization. "Perhaps they don't have the right vendor or vendor partner that provides those capabilities," he says. "Maybe the organization doesn't see the value of the technology. It really depends on the hospital's goals and objectives." No matter how the technology dollars are being spent, Daniels believes analytics will eventually become a priority. "Most hospitals on the path to advanced EHR capabilities know it has to be funded," he says. Organizations are asking themselves how they can get more bang for their EHR buck, Voltz says. However, many take a wait-and-see approach to observe how other organizations and the industry in general fares with new EHR projects, refusing to chase EHR enhancements until they see proven paths that can be duplicated. 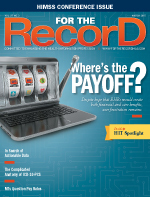 "Hospitals are still trying to find value in their EHR. They're thinking, we were not sold a bill of goods, but we're not going to throw another $5 million at this problem until someone demonstrates that they can improve things," he says. "We're sitting on a gold mine of information and we've got to creatively look at the data, look at the cultural and economic data, the wealth of data that can be tapped so decisions can be made in a positive way." In the current environment, Tran cautions organizations not to get ahead of themselves and move to the analytics phase when they're not ready. "They have data, but what is sorely missing in health care is making sure the patient information flow is in support of the operational care environment," he says. "Data analytics is useful, but there is no direct impact on patients. What's needed is improved care while the patient is still in the bed. Patient information flow is missing completely." Emily Patterson, PhD, an assistant professor in the division of HIM and systems in the School of Health and Rehabilitation Sciences at Ohio State University, is encouraged by how organizations are using HIT, noting that many hospitals are undertaking unique and innovative projects. For example, there now are ways to examine health patterns that previously would have gone unnoticed. Because of these opportunities, there's likely to be near-term improvement in the ability to flag patient conditions and to provide real-time care improvements. Despite the lack of measurable return-on-investment indicators, EHRs loom large in health care's future. However, Voltz says the technology doesn't always deliver on its promise. "What we've paid for the technology and what we've received are not equal to each other," he says. "What we've gotten from the data is not what we need nowadays. Vendors say we can do that, we can do that, but the systems can't. It's a Band-Aid." McKenna says the technology is evolving, though, pointing out that five years ago EHRs were data prisons and today's sophisticated systems did not exist. The technology now is being built with analytics and accountable care in mind even as vendors remain in awkward positions as they operate in an environment where they're simply trying to keep their heads above water, serve clients, and meet federal mandates, he says. Tran believes EHRs serve a purpose but expectations for its power to transform care must be kept reasonable. "It's true that EHRs can help us make big steps forward with data structure, but having the data doesn't necessarily solve problems," he says. "EHRs are very good, strong medical recording systems for patient data, but no EHR can address every specific need." — Scott E. Rupp is a Florida-based freelance writer.